Floating shelf brackets that have your books floating on the walls – if you’re climbing the walls for ideas they’re the answer. Floating shelf brackets to make a hidden bookshelf that gives the appearance of books floating on your wall is a pretty cool design idea. Bare bodies might sometimes be fun to look at but bare walls are just boring. When you are restyling your room you want it to stand out from the crowd. Then there is the functionality of the room too, something often discarded at the expense of over thought design. We want things that please the eye but we also want some practicality. The Umbra conceal floating bookshelf provides design ‘chic’ whilst giving you somewhere to hang your books. Talking of concealed bookshelves, whilst we don’t want ugly shelves to look at, we do want to show that we do read the occasional book. It makes us appear more intellectual, depending on the books you have visible of course. That also fulfils a design aspiration, since design intends to raise form to a more thoughtful place. Returning to the rather simple idea of floating shelf brackets hidden under the books it holds, the book support is simply fixed with wall plugs and screws to the wall. The bookshelf will support about 6 medium sized hardback books, maybe more, and about 15 lbs in weight. There is a larger version which can support about 20 lbs in weight if you need something larger. 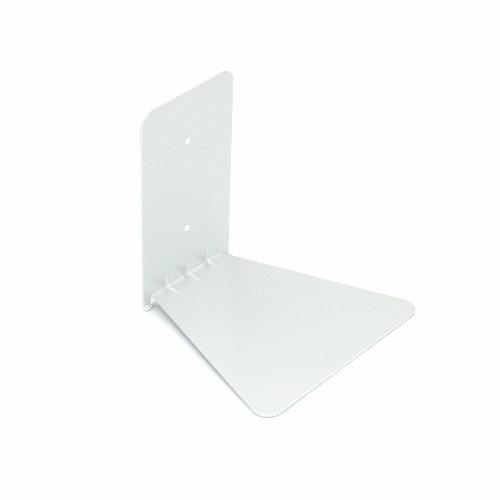 The conceal book shelf fixing section is about 5 inches high, the support section stands out from the wall about 5 inches and is 5 inches wide. The larger bookshelf is 5 x 7 x 6.5 inches. When you have loaded it up with books, the shelf is concealed and the books appear to be hovering on the wall as if by magic. Fixing the bookshelf is a simple matter of screwing it into the wall. If you have stud walls rather than solid block or brick, then you will need to locate the studs to fix too. Do not forget to check for any hidden cables as well, especially when fixing vertically above or below an electric outlet in solid walls. However cables can be hidden in a wall anywhere, so take care. The Conceal wall shelf is a floating bookcase that becomes invisible once stacked with hardback books. You simply slide the back cover of the book under the shelf and into the holding clips to keep it in place. Then the remaining pages sit atop the shelf and other books loaded on top. Obviously, better to fit the large books first and preferably one you will not be reading very often. Your books will appear to be floating on the wall! As you can see where you can play with positioning to create whatever effect you’d like. Here is a home office environment. The shelf is equally suited to serve as a regular shelf for storing small items such as a potted plant or Bluetooth speaker, or maybe even as a stable support for a small movie projector maybe. The hidden bookshelf is an original, modern, casual and functional way of decorating your walls rather than have you climbing the walls thinking of ideas! It is easy to install, effective and eye-catching and has even won several awards such as the Umbra-Pratt Design Competition in 2006. If you fancy the idea of floating books on your walls, certainly something different, then go buy an Umbra Concealed Bookshelf today. Can make your room that much cooler. Holds up to 20 lbs of weight.